another one if you liked the binary metal. particularly funny if you play guitar from tablature. Hamberger. Hi. Smile Hello. Go Packers." Think of some primitive tribe member seeing this. Now, where do ideas of werewolves, skin changers, and shaman trying to turn into animals come from? This is the very purpose of this thread. I don't know why, but taking dramatic scenes and re-purposing them for lame dad jokes absolutely slays me. What a big disappointment this guy became when he took off his mask. You didn't like him, Ant? I thought he was pretty cool. Did you want him to be more sinister under the mask? I do think it's a bit much that everybody in these movies HAS to be related. We are definitely going to find out that Snoke and Palpatine are second cousins to Amadalla or something. And what about not 1, but 2 people who have never used light sabres before putting up a decent fight against Kylo Ren?! I did really like the movie though. 1) I was disappointed that he turned out to be some adolescent emo kid. Maybe someone just a tad older would have been better. 2) Has it been settled that it's actually Snoke? I mean, I've read a lot of the speculation that makes some sense, but not certain if it's all settled. Disney announced that the Star Wars Universe was no longer cannon. If it's Snoke then they've borrowed from cannon. Hmmm? The movie was okay for me. A couple of friends of mine who are first generation star wars fans hated it. I was disappointed Luke didn't get just a little more screen time. Rogue One looks like it has some good potential. Last edited by ant on Wed Apr 20, 2016 12:26 pm, edited 1 time in total. Kylo being an emo kid is not great... I prefer a comic book doctor doom to a movie doctor doom every day of the week. But i'll take it, and he's doing a good job in the role. If just some random dude can pick up a light sabre and hold off Kylo... then what's the point of all that Jedi / Sith training? 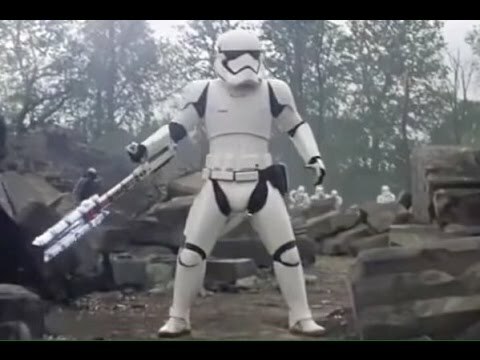 TR-8R pounded Finn into the ground. So Finn gets no additional light sabre, or even melee training in between and he's standing up to the film's top villainous force user? Does that mean that TR-8R might have beat Kylo if he didn't resort to the Force? yeah... that really bugged me, but over all I think it was the best one since probably Empire Strikes Back. also, TR-8R memes are great. Kylo Ren is conflicted, his inner turmoil weakens his killer instincts, I mean...this is the son of Hans Solo and Leia Organa after all. Finn and Rey have a common base level struggle that is survival. Killing your pappy is one thing, But does our burgeoning dark lord have what it takes to do in mommy as well?. Kylo Ren' struggles have only just begun. The love triangle is another teaser, Luke lost his sisters child to the dark side, might he lose Rey too? Finn was born and bred to kill, to follow nothing but orders, He could not, he has a natural empathy, sympathy for innocence, The force is within him. Kylo's inner wavering is his Achilles heel, until he does mom he will always be weak. Finn's inner morals make him a natural force for good, but he will follow his hearts infatuation. Rey is the enigma, she appears to have a pure heart but what will be her temptation? The guy born into badness or the guy who thinks evil is a calling?. I think one of the reasons Kylo is so conflicted is because he's trying to come to terms with the fact that his grandfather was black. There's simply no way Finn should have ever been able to hold his own for even a second against Kylo. That was really corny of the producers. I think the original plan should have been actualized - making Star Wars - Knights of the Old Republic. That would have given us a really fresh start because it takes place a thousand years before Anakin Skywalker. I am disappointed that Disney purchased the Star Wars Universe. I don't like their characters. And they are close to ruining Star Wars Rebels. The Clone Wars was really REALLY good. The SW Universe has so much to it. Disney is going to eff it up. that's one way to solve the problem!